Great Wall Motor Company Limited is China’s top SUV & Pickup manufacturer. With more than 30 subsidiaries and 28,000 employees, it is capable of producing 500,000 vehicles per year that fall into three categories of HAVAL/HOVER (SUVs), Voleex (Passenger Cars) and Wingle (Pickups & MPVs). It is also able to produce core parts such as engines and front & rear axles on its own. 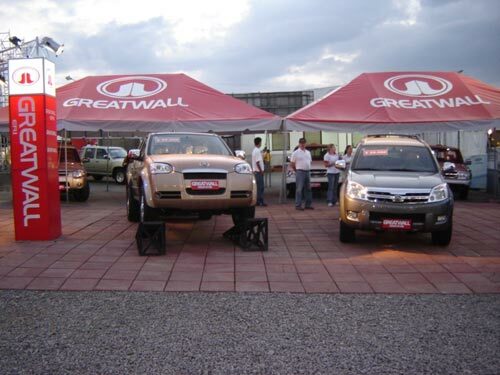 The Great Wall Motor Company (GWM) has several awards under their belt. GWM has been listed in the Forbes Top 100 Chinese Enterprises twice, along with the honor of “China’s 500 Most Valuable Brands”, “Most Valuable Listed Automobile Company”, “No. 1 of Top 10 Listed Chinese Automobile Companies”, “Brand for Export” recommended by China Chamber of Commerce for Import & Export of M&E Products and “National Base for Whole Vehicle Export ” designated by MOCOM and NDRC. Since 2004, GWM has been awarded as “Top 10 Listed Private Companies”, “Top 500 Chinese Enterprises”, “Top 500 Chinese Machinery Manufacturers”, “Made-in-China Top 500”, “Top 500 Chinese Industrial Enterprises” and “Top 30 Chinese Automakers by Sales Revenue”, etc. GWM has a solid & stable business foundation which operates so well among all independent Chinese auto brands that it has gained high growth rate and profit for 10 consecutive years. Never being burdened with loans or debts, GWM achieved rapid growth of 99.4% Year on Year to 1.002 billion yuan in consolidated net profit in 2009. As of December 31, 2009, the total assets of GWM amounted to 15 billion yuan. The constantly rising stock price has made GWM the most potential force of Chinese independent brands. GWM has a sound 3A+ creditability rating by major government & private Chinese banks. Great Wall Motor has been a leading player in both domestic and international markets. In 2009, the Company changed its development mode and adjusted the product mix by boosting three range of vehicles, namely Hover, Voleex and Wingle. Great Wall Motor has been a leader among Chinese brands in respect of export volume and export value in the overseas markets since several years. Currently, GWM exports its products to more than 100 countries and regions across the globe including Italy, Australia, New Zealand, Russia, the Middle East, East Asia, India, Philippines, Brazil, Costa Rica and African continent including South Africa. GWM’s most popular product is its Hover SUV. Winner of the CCTV Award of China’s Best Self-owned SUV, Hover SUV has boasted the largest sales and export volume for 7 consecutive years among Chinese self-owned brands. Hover also boasts a 4 star crash test rating from Australian ANCAP which adds up to its ‘safer’ reputation also. Another key factor in the success of Hover is its price which is dirt cheap as compared to the vehicles it rivals. Hover is also the 2nd best selling SUV in China after Honda CRV. The GWM Wingle Pickup has kept its first place in terms of sales volume, market share, export volume and possessing capacity in the market for 12 consecutive years. It is also first Chinese made Pick Up to be sold in Australia. The single cab version also serves for Reshebile Aviation of South Africa, where they can be found at Johannesburg, Cape Town, Port Elizabeth, East London and Durban airports. Like most of the Chinese manufacturers, GWM also has a history of design piracy. In December 2006, Italian automaker Fiat took legal action against Great Wall Motors, claiming the design of the ‘GWM Peri’ as being a copy of their popular second generation Panda. Another GWM product the ‘Coolbear’ have a great resemblance with Scion Xb. The GWM Florid is a copy of the first generation Toyota IST combined with nose section inspired from the second generation Toyota Vitz. The GWM i7, which is now labeled as Voleex C10 is also heavily inspired from a second generation Toyota Vitz. However the designs coming out of GWM factories recently are very original and appealing such as the Voleex C30 sedan which has become one of the most successful sedans in its class within just a few months of its launch. There was a huge array of concept cars displayed at recent auto shows by GWM which will be launched in coming years. Great Wall Motor has sales outlets, 4S shops and authorized service stations in 254 cities across China. Its service network covers the whole nation, with each center providing service to the places within 50km radius of itself. Great Wall has also built assembly plants in Russia, India, Iran, Vietnam and Egypt through cooperation with its local partners while it also aims to enter the US market very soon. The progress of Great Wall Motors has been remarkable within China and pretty satisfactory in overseas market so far. Looking at the rapid progress of GWM, we can safely say that in coming years Great Wall Motors will emerge as a global automobile giant from Chinese soil. I Saw a wingle yesterday in Lahore and totally fell for it. The size, outlook and the feel was really good. However I gone through the NET but could not find a dealership. Can anyone shed some light as to who is dealing with GREAT WALL in Pakistan?